Front row (left to right): 1. Gary Butterfield, 2. Finis Hudson, 3. John Aflague, 4. unidentified, 5. unidentified, 6. Gary Saunders, 7. Dennis Richardson, 8. Paul Chaplic?. Second row: 1. unidentified, 2. Karen Butts, 3. Marilyn Steele, 4. Dolores Banuelos, 5. Susan Hahn, 6. Joanne Moomau, 7. Carolyn Walker, 8. Susan McLaughlin. Third row: 1. Mrs Meamber, 2. Judy Thonack, 3. unidentified, 4. Nellie Draffen, 5. Pat Potter, 6. Mary Ruth Wallace, 7. unidentified, 8. Vicki LaBorde, 9. unidentified, 10. Lois Anderson. Fourth row: 1. unidentified, 2. Dahl Stanford, 3. Maynard, 4. Kirk McNutt, 5. Frank ?, 6. Paul Armstrong, 7. Jim Strom. Credits: Scanned by Dahl Stanford. 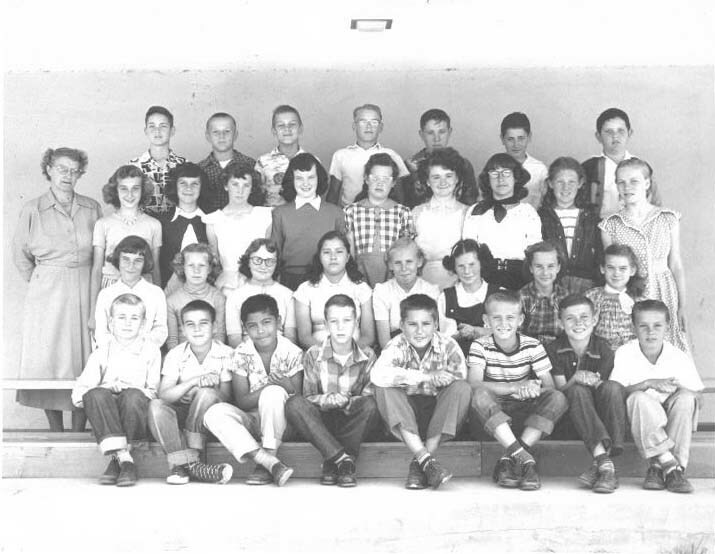 Thanks to Dahl Stanford, Susan (McLaughlin) Beus, Delia (Jeffery) Ingersoll, Esther (Cleek) Rupley, and Jim Street for identifying the kids in this picture.